Designed to reduce friction, allowing minimal tissue irritation during insertion into the bladder. Integrated package contains a hydrophilic-coated flexible PVC catheter and sterile saline solution pouch. Coating is activated by soaking the catheter in the 0.9% sterile saline solution for 30 seconds, creating a slippery and low-friction surface so insertion and removal is effortless. Soft silicone introducer tip protects the catheter from the bacteria residing within the distal urethra. 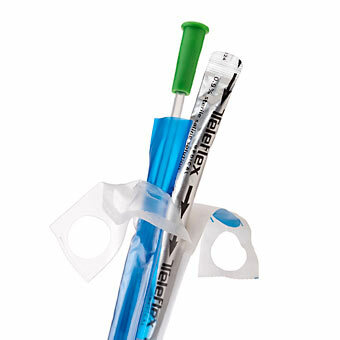 Patented sheath maintains and protects the sterile catheter during insertion, and facilitates sterile catheterization technique without additional gloves or messy gels. Easy opening and handling tab to assist those with loss of dexterity. Ultra smooth eyelets provide maximum comfort upon insertion and removal. 90% less friction during insertion or withdrawal for less pain. Self-adhesive patch on the back of the package allows adherence to surface to free both hands.